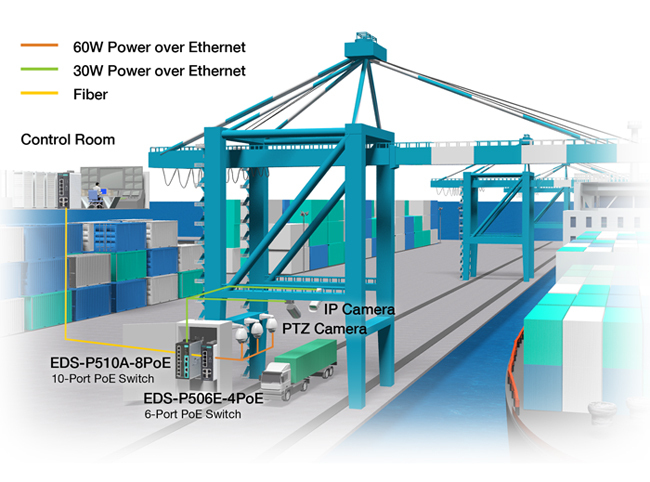 A global port operator selected Moxa’s PoE switches to provide highly reliable data transmissions for their crane optical character recognition (OCR) system. The crane OCR system is used to track and monitor the loading and unloading of freight containers at port terminals. As the key to automating the cargo handling process, the reliable OCR system improves the efficiency of moving containers from ship to shore and reduces occupational hazards for personnel. In order to realize these benefits, the port system integrator had to overcome critical challenges to building a reliable crane OCR system. These challenges include deploying wiring in an environment with many obstacles, providing power supply for a variety of high-resolution outdoor cameras, ensuring reliable data transmissions, and reducing maintenance efforts. To automate the container checking process, the crane OCR system is equipped with multiple cameras to capture images of all passing containers, including each container’s serial number, from different angles. Some of these cameras are high-resolution PTZ cameras that have above-standard requirements, such as power input of 60 W per port. Moxa provided a complete portfolio of switches to satisfy all camera requirements. Solutions included the EDS-P506E-4PoE managed switch, which provides high power output of up to 60 W per port. If the demand for power is not high, there are other cost-efficient options such as the EDS-P510A-8PoE, which is a managed switch with 8 PoE ports. The managed switches provide high MTBF and protect against extreme environments where outdoor crane systems are often used. Moreover, Moxa PoE managed switches include a built-in “Smart PoE” feature to support remote powered device (PD) management, including PD status monitoring, remote PoE port power cycling, and PoE port power cycle scheduling. These switches not only satisfy all of the system requirements, but also enable smooth operation and reduce overall maintenance costs. Moreover, reliable data transmission is necessary for sending real-time images back to the port terminal’s remote control center for further identification and analysis. Moxa’s redundancy technologies, Turbo Ring and Turbo Chain, are specially designed to protect networks against transmission failures. Turbo Ring and Turbo Chain both support millisecond-level fast recovery to ensure that there are no interruptions to image data transmissions. However, there are certain situations when redundancy technologies alone do not suffice. For example, a device could malfunction or lose cable communications. By using Moxa’s easy-to-use MXview or MXview ToGo graphical network management software, system administrators can remotely and effectively visualize the crane OCR system network to gain immediate insights and take the necessary steps to resolve network problems.